New York has the Statue of Liberty, London has the London Eye, Paris has the Eifel Tower India has the Taj Mahal and Kampala has the Gaddafi National Mosque. Situated on the top of Old Kampala Hill, Gaddafi Mosque is one of the interesting attractions which can be explored by visitors on Uganda safaris to Kampala. The mosque is the head administrative Center of the Uganda Muslim Supreme Council the organization which takes care of all Islamic affairs in Uganda. It’s a two fabled building and the mosque is on the upper floor while the offices are on the ground floor. Ground work began again in 2004 when the old unfinished establishment was demolished. It was officially opened and inaugurated in 2008 by the late Colonel Gaddafi himself who was on Uganda Safaris to attend the event that was attended by several African heads of state. Gaddafi Mosque can accommodate 35,000 worshipers and the number doubles during the holy month of Ramadhan and on special Islamic days when even some Islamic brothers under take safaris to Uganda. On holidays like Eid when Muslim travelers in Uganda Safaris are flocking to the mosque, it accommodates about 200,000 people. This minaret which is open for viewing by the general public has a staircase of three hundred and four stairs. It is completely built from reinforced concrete and the view of Kampala City on top of this minaret is breath taking. It is a favored spot by professional photographers and tourists on Safaris tours to Uganda who want to get a scenic view of Kampala City. Tourists on Uganda gorilla safaris tours are welcome at the Gaddafi Mosque and should dress modestly. Women should wear loose fitting clothes covering to the wrist and ankle and cover their heads. Coverings are available at the reception for those who need them and should be returned after the visit. Men should wear trousers, shirts with sleeves. There are two parts of the mosque; the ground floor which is open at all times and the first floor which is only opened on special occasions like Eid or weddings. The minaret is always closed but opened on request when accompanied by a guide. Foreigners are charged 10,000 UGX for viewing the inside of the mosque and going up to the minaret with a guide but it’s totally free for Ugandans. 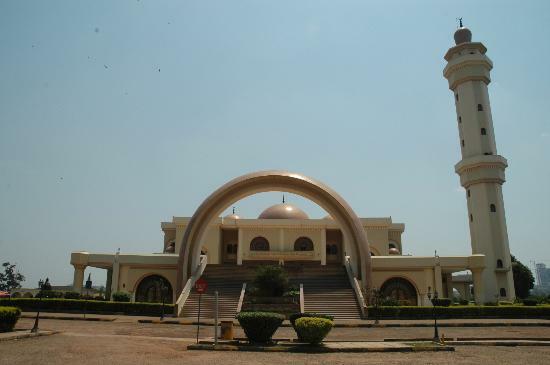 For visitors undertaking safaris in Uganda, Gaddafi national mosque, is one prime spot in Kampala one must not miss. There are well trained guides at the mosque that offer to take you around with a great a smile.